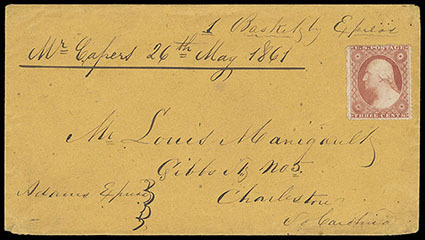 Confederacy, 1857 3¢ Dull Red, uncancelled on cover with manuscript Mr. (Ellison) Capers (Capers Island, SC), 26th May, 1861 sent via Adams Express along with "1 Basket by Express" addressed to Mr. Louis Manigault, Gibbs Street No. 5, Charleston, SC., Very Fine and unusual. Ellison Capers' family owned the Island of Capers. Ellison would rise to the rank of Brigadier General in the Confederate Army replacing Brigadier General States Rights Gist who was killed in action. Confederacy, Charleston S.C., Apr. 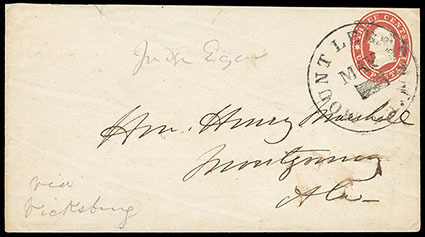 27, 1861, double circle postmark on 1853-55 3¢ Nesbitt entire to Marion Court House, SC. 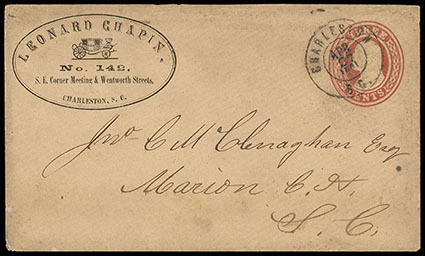 with Illustrated Carriage Advertising Corner Card, flap torn, Very Fine, an attractive Confederate States use of this corner card cover, Leonard Chapin enlisted in the 5th South Carolina Cavalry Regiment, Company B known as the Dixie Rangers in 1861. Later, Leonard was part of the 17th Battalion of the 6th South Carolina Cavalry and served until October 1864 when he was wounded., ex-Kohn, Calhoun. 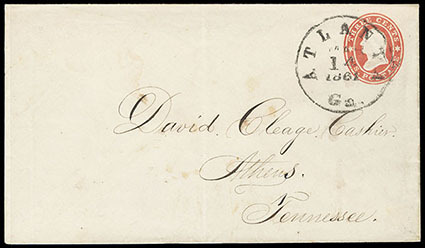 Confederacy, Georgia Use of U.S. Postage, group of 3 covers from same correspondence to Calhoun Ga. comprising "Clarksville Ga. Apr 15" cds ties U.S. 3¢ #26, 1861 docketing; "Rome Ga., Mar 30" cds cancels U.S. 3¢ red (U27) buff star die entire, 1861 docketing, and "Atlanta Ga., Mar 14 1861" cds on U.S. 3¢ red (U26) star die entire, F.-V.F. trio. Confederacy, Mount Lebanon, La., May -, clear cds cancelling on U.S. 1860, 3¢ Star Die entire to Confederate Congress member Henry Marshall in Montgomery, Ala., pencil "via Vicksburg" routing notation, Very Fine, a nice used in the Confederacy usage from Louisiana. Scott No. U.S. U26 Estimate $150 - 200.